Train accidents are more common than you might think. There are approximately 3,000 railroad accidents every single year, about a third of which result in death. Passengers, pedestrians, railway workers, and occupants of nearby vehicles or buildings often sustain catastrophic injuries. In fact, it’s rare to hear of a “minor” train accident, though even in those cases, the damages can take an enormous toll. Van Sant Law, is an experienced Alpharetta personal injury law with a comprehensive understanding of train-related injury law. A Georgia train accident lawyer in our firm will help you claim compensation from the responsible parties, which may include the train car manufacturer, railway employees, the company that runs or owns the train, or even third parties that may have created a dangerous condition on the tracks. 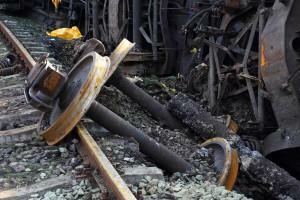 Our firm works with expert investigators who are specifically trained in railway accident investigations. We utilize these resources to build your case and make a compelling argument for liability. How Do Train Accidents Happen in Georgia? The companies that own and operate trains and their rail lines typically carry large insurance policies to cover derailments, collisions, and other such incidents. Nevertheless, you should never talk with insurance representatives without first consulting a Georgia train accident lawyer. It is the job of an insurance adjustor to pay you as little as possible. Meanwhile, as a Georgia personal injury law firm, it is our job to ensure you get paid every penny you’re entitled to under the law. That’s why it is so important that you call us before considering any other party’s offer. As your train accident lawyer in Alpharetta, GA, we can handle everything relating to your case, including negotiations with insurers. From accident reconstruction to medical damages, we’ll work with qualified and respected experts to build an effective case. Because relatively few law firms focus on train accident litigation, we make our services available to clients throughout the entire state of Georgia. Whether you live in Alpharetta, Atlanta, Fulton County, or anywhere else in the state, we will do whatever it takes to zealously advocate for your interests. To schedule a free consultation with Van Sant, today, just call our office or contact us through our online contact form.